August 4, 2016 August 3, 2016 Amanda B. Using dice in your math centers is great. They’re inexpensive, versatile and fun! With that in mind, I created a few more activity packs to be used with dice. These packs require little to no prep, and can be used and re-used throughout the school year. The first one I showed you earlier this week: Add Around the Room. It’s a write-the-room activity using dice and addition. This next one, requires hardly any prep. Photocopy the activity you want to do… and you’re ready! 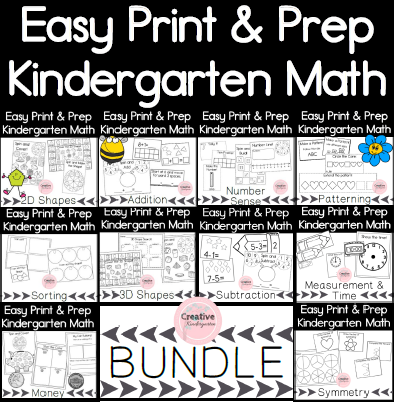 It includes 6 addition and subtraction worksheets that you can use with small groups, or for independent work. If you want to re-use these sheets, you could put them in plastic page protectors and use whiteboard markers. *Put out only the red cards and the Dice Adding printable. Have students pick a red card and write the math sentence on their own. You can also choose how many cards you want to put out to make the game easier or harder for the students. My next post will have one last dice activity pack and I am pretty excited to share it with you!